Back in the groove(or is that a rut), We made it back from Italy without all the terrible thing that happened on the way there but it was not uneventful. While boarding the plane Kristina found that Ian had a temperature and felt very hot. not to long after take off I borrowed some Tylenol from another family as ours was checked, that kept his fever down but it kept coming back up when the medicine would wear off. When we landed in Atlanta and got to out thermometer he had a temperature of 104, we were in the emergency room in less than 20 minutes. Need less to say the doctor said to keep doing what we had been doing but to come back in 2 days if he isn't better. He was fine the next day. I can't say that I was a little scared on the starting line, this field was stacked. 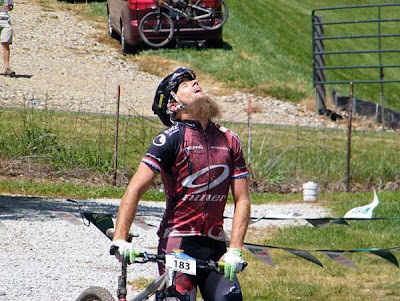 If you are a fast ultra endurance singlespeeder from the east you were at this race, I couldn't think of anyone besides (Ohio)Rob that wasn't there. Going through what I had in the last week, it was hard to be confident. Since DSG I haven't really ridden my bike other than racing, the blisters on my heels were so bad that I couldn't wear shoes. I had no idea what my legs were capable of, I hadn't ridden 100 miles in any 2 week period since April. 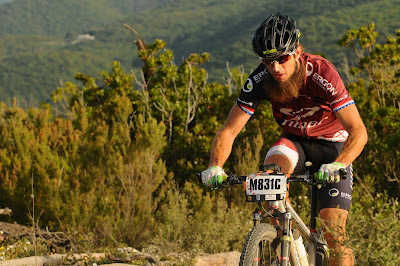 I stayed with my usual tactic of starting fast, and was the lead singlespeeder going into the first singletrack. Shortly there after I knew I didn't have the legs for racing the top geared riders like I end up doing. I backed off and decided to let the next singlespeeder catch me then I would just match him and hope that he would POP before I did. He was strong, attacking every steep hill, but he was never far in front at the top. and I was able to catch him on the descents. We exchanged the lead a few times on the singletrack, he would attack the climbs and I would pass him as he made wrong turns. After aid 2 we were caught be the first Pro men's chase group(they made a wrong turn) that had 6 riders. and this really put the hurt on me. it was a battle of wills to see which one could hold on the longest. Even with the geared riders he attacked the climbs trying to drop me, I managed to be in 3rd wheel going into the single track before aid three. after a few minutes I looked back and couldn't see him behind me, I figured he flatted or something. I knew he was strong, he couldn't have dropped off that far. by the time I got to aid 3 I knew I had at least 1/4 mile on him. The super high cadence needed to stay with the geared guys brought the cramps. there was a few time that I had to stop and stretch, or really slow down. I had about 40 miles to go after I got passed by josh Tostado(he got lost too), and from that point it was pretty lonely. long, Straight, boring, strait, flat roads then a couple big climbs to the finish. Walking across the finish line in first place. So glad to be done! I finished in 7:39:@# about 20 minutes faster than second place Dejay Birtch(Niner/Ergon teammate). the guy I had been racing the first half of the race had broken his frame. In endurance racing it's not always the rider that makes the difference. 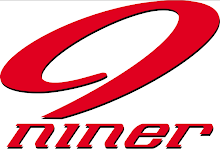 Niner thanks for making such great bikes! Great race @ Mohican man, you and Dejay blew the SS field away. It was an honor kickin it with you and Kristina, Ian, Dejay & Rebecca. I was really lovin life that weekend. Keep livin the dream! PS: Diggin those new team edition Ergon grips, thanks guys.